This review first appeared in the February 2009 issue of hi-end hifi magazine High Fidelity of Poland. You can also read this review of the Luxman L-550A II in its original Polish version. We publish its English translation in a mutual syndication arrangement with publisher Wojciech Pacula. As is customary for our own reviews, the writer's signature at review's end shows an e-mail address should you have questions or wish to send feedback. All images contained in this review are the property of High Fidelity. - Ed. Luxman is a brand of the Japanese Luxman Corporation which recently rose like a phoenix from the ashes. Initially managed from Hong Kong where its management was located, it is now a wholly Japanese company. There might be certain affiliations with China at least with chassis production or parts procurement (mere assumptions on my part not confirmed by any proof) but design and manufacture are squarely based out of Japan. We have already tested a few Luxman products and over the past 6 months, my reference system has hosted their M-800A power amplifier. I thus have some ideas on the company's offerings, its direction and ideals. The L-550A II under review is quite a recent addition whose first iteration was presented together with the L-590A in 2005 for the firm's 80th anniversary. Since then some modifications were made mostly to conform to RoHS regulations. 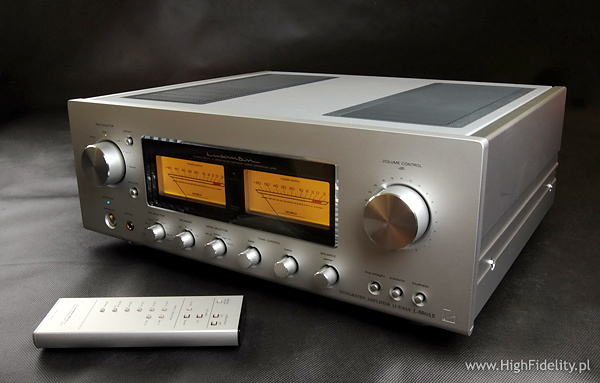 During the 2009 CES in Las Vegas two even newer products were launched, the SQ-38u tube integrated and the D-08 SACD player. Today's loaner is an integrated amplifier whose stages operate exclusively in class A. This includes the output stage which is capable of 20W at 8Ω and 40W at 4Ω to draw parallels with another Japanese company and recent reference point for Luxman, Accuphase and their A-550 amplifier. That's another class A integrated, albeit 50% or 10 watts more powerful and 100% more expensive. So the L-550A II is an integrated amplifier like the Accuphase, McIntosh and Leben CS300 to become the center of a system. This approach was favored by nearly all companies during the 70s and 80s but for most no longer holds true. Looking at the recently reviewed Aaron Model No.1a or even better, this issue's Belles IA-01, we know that the top devices in this class tend to have minimal functionality and the shortest possible signal paths. I understand the trend and with hi-end at the very pinnacle, it couldn't be any different. Alas at the level I am talking about today, things are different. Many audio folk point out that ridding us of tone controls, balance controls, mono switches and recording selectors was at least initially not for sound quality but cost cutting reasons. Well-implemented tone controls are expensive as we can see in Accuphase and McIntosh amplifiers or the Cambridge Audio Azur 840E preamplifier. Eliminating them meant significant cost savings. It was far easier to ditch those features and justify the cuts by talking about the sound - because in most instances, this indeed did result in better sound. If for a given amount of money however somebody can propose a component that is loaded for bear, with sound qualities similar to a stripped down, functionally crippled competitor, then choice is reduced to taste and expectations, not sound. Pluralism adds value and we must accept that there isn't a single true path for reaching our dreams of sonic fulfillment. Music used for testing: Dire Straits, On Every Street, Vertigo/Universal Music Japan, UICY-93734, SHM-CD | Solveiga Slettahjell, Silver, ACT 9715-2, CD | Genesis, Calling All Stations, Virgin Charisma/EMI Music Japan, TOGP-15019, SACD/CD+DVD-A | Herbie Mann & The Bill Evans Trio, Nirvana, Atlantic/Rhino, 90141, CD; Atlantic/Warner Music Japan, WPCR-13181, SHM-CD | Gerry Mulligan & Thelonious Monk, Mulligan Meets Monk, JVCXR-0032-2, XRCD | Woong San, Feel Like Making Love, Pony Canyon Korea Inc., PCCY-50014, HQCD | Peter Gabriel, IV (Security), Geffen/Warner Bros./BMG Direct, D 153801, CD Virgin/EMI Music Japan, VJCP-68848, CD | Kathleen Battle, Grace, Sony Classical/Sony Music Japan, SICC 20023, Blu-spec CD.